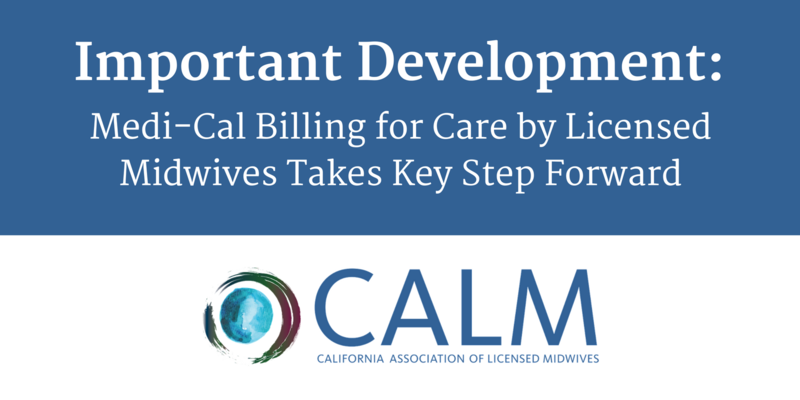 Thanks to ongoing advocacy by the California Association of Licensed Midwives (CALM), Medi-Cal billing for the care of licensed midwives has taken an important step forward. We are delighted to announce that LMs can now begin the enrollment process to become Medi-Cal providers. This change will be retroactive to July 1, 2015. CALM legal counsel interprets this to mean that, although the date when you enroll will be the official date for your services for Medi-Cal clients to become billable, in fact, any care you may have provided to a Medi-Cal-eligible client prior to that date can be billed retroactively to July 1, 2015, assuming you have not accepted payment from that family for care. These changes are the result of significant, ongoing advocacy by CALM and CALM’s legal counsel, Susan Jenkins, JD. We interviewed Susan to help us all learn more about what has happened so far and what to expect next. CALM: Susan, we thought Medi-Cal billing was already in place? Can you help us understand what has been happening since enrollment for Medi-Cal opened last spring? Susan Jenkins, JD:California law has included Licensed Midwives as an approved category of Medi-Cal provider for many years. Because the LM practice law required supervision, however, LMs could not enroll as independent Medi-Cal providers until CAM achieved repeal of that requirement through AB 1308. The first step, removal of physician supervision as a result of AB 1308, cleared a significant hurdle for Medi-Cal billing by licensed midwives. After the bill became law, CALM entered into an ongoing dialogue with the officials in charge of Medi-Cal benefits at the California Department of Health Care Services (DHCS) to educate them about why and how they needed to make changes in their rules and processes so that LMs could be included as independent providers. That dialogue took several meetings and conference calls with DHCS officials, and concluded with DHCS taking the necessary steps with the federal Medicaid agency, CMS, to allow for reimbursement of independent licensed midwives in California. That was completed in September of 2015 and, as expected, approved by CMS in mid-December. The next step was to meet with a different division of DHCS, Provider Enrollment, to confirm the codes and clarify the process for enrolling licensed midwives as Medi-Cal providers. CALM worked with DHCS to establish these processes. 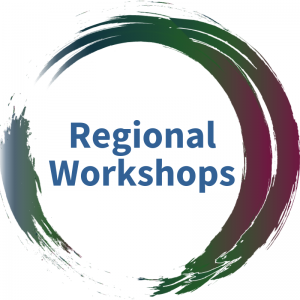 Then, last spring, CALM/CAM held a webinar to advise all state LMs how to apply to become an enrolled Medi-Cal provider, including the forms to be filled out. When the first LM applied, however, she noticed a glitch, which she brought to CALM’s attention. It seems the subcontractor that administers the details of enrollment, billing, and payment for DHCS (XEROX) mistakenly enrolled the midwife as a CNM rather than an LM. The miscategorization highlighted an issue with the process, which can be challenging to unravel in a bureaucracy as large as the billing and coding subcontractor for DHCS. CALM: Why is it significant that the midwife was enrolled as a CNM rather than an LM? Susan: We have seen situations in other states where a midwife has been accused of Medicaid billing fraud for accepting payment made out to her as “CNM” rather than “LM.” It also highlighted that the subcontractor was not yet fully grasping the changes in DHCS policy around billing for LMs. This is why we contacted DHCS immediately and are working closely with the subcontractor and DHCS officials on resolving the issue. 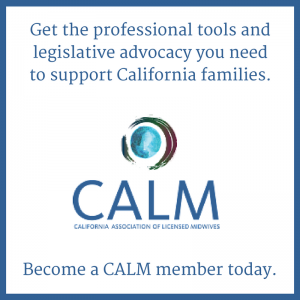 CALM: Does the Newsflash mean that midwives can begin billing Medi-Cal now for eligible families? Susan: The Department of Health Care Services (DHCS) tells us that they are “in the process of making system changes to accept and process claims submitted by LMs for obstetrical services rendered. This means that the software is not yet all in place and that CALM needs to continue to monitor DHCS and their contractor until the system changes are in place. They promise everything will be fixed by January 2017. CALM: Should LMs who are interested in accepting Medi-Cal apply now to enroll, or should they wait? Susan: Midwives should absolutely be applying now. Each midwife’s application will become retroactively effective on the date of her application, not when it is fully processed. Applying to become Medi-Cal eligible also serves an important advocacy role. We want to show DHCS that LMs are a valuable source of perinatal health care providers with proven results, and are eager to provide care for low-income women. CALM: Can LMs accept Medi-Cal clients now? Susan: Yes, absolutely, as soon as you apply. Don’t try to submit bills for a few months, however, until they announce that all the processes are in place. One more point: It is important to remember that Medi-Cal does not allow for balance billing. LMs may not accept any additional payments from the family for services that are or will be billed to Medi-Cal. Susan: CALM and I will continue to monitor the process and advocate for the complete roll-out of the needed processes for enrollment and billing. We now have a good relationship with many of the managerial-level DHCS staff; they keep in touch with us and many seem to sincerely favor making your services available to their beneficiaries. CALM: What can LMs do to help? Susan: Apply now to become a Medi-Cal provider! Be sure to let CALM know about any irregularities in the process. It was a CALM member who alerted us to the fact that LMs were being enrolled as CNMs in error. Your on-the-ground knowledge helps us advocate for you. If you encounter further glitches at any time from the XEROX subcontractors who administer the program on a day-to-day basis, just let us know. We can make a few phone calls to try to work things out with DHCS officials. Find the CAM/CALM webinar here, a transcript of the webinar here, and a blog post here on the Medi-Cal enrollment process. In the process of becoming Medi-Cal enrolled? Join our secret Facebook group by emailing policy@californiamidwives.org. Having challenges with the process or are experiencing irregularities? Contact president@californiamidwives.org ASAP. CALM is a largely volunteer run organization, but our efforts are aided by high level experts such as Susan Jenkins, who ensure that our efforts are strategic and effective. We need your support to keep valuable experts like Susan on-board.